Electronic Arts held their first-ever EA Play press event earlier today. If you missed out on the festivities, we’ve got you covered with this handy summary of all the big announcements and glossy new trailers. 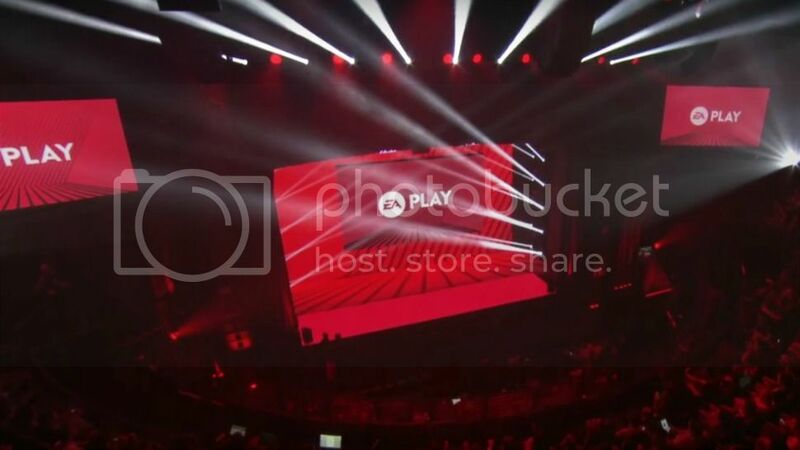 EA CEO Andrew Wilson kicked things off by hyping the EA Play format, admitting that it’d be impossible to sufficiently show off everything they’re working on in only an hour. So instead, think of this as a taste of the great projects in development and “opening the door to players, influencers, media, and partners” and inviting them to play. After a quick shout-out from Peter Moore, broadcasting live via satellite from another EA Live event in London, Wilson ran down the line-up, including details for Mass Effect: Andromeda, a glimpse into upcoming Star Wars projects, and a Battlefield 1 gameplay footage. Respawn Entertainment’s Vince Zampella welcomed PlayStation 4 players to the world of Titanfall 2. He then revealed the first multiplayer gameplay for Titanfall’s sophomore outing. Building upon the foundation laid in the first game, Titanfall 2 features six new titans, expanded customization options and deeper progression. Online looks to retain the same chaotic action and David vs Goliath-esque encounters. Respawn is planning a pre-launch multiplayer ‘technical test,” which players can sign up for by visiting Titanfall’s website. “For the four people who didn’t see the leak this morning,” Zampella officially confirmed a single-player campaign for Titanfall 2. This offline story mode will delve deeper into the Titan/pilot relationship as well as expand on the series’ mythos in general. Titanfall 2 releases October 28 for PlayStation 4, Xbox One, and PC. A new Madden 17 trailer was used as the flag bearer to wave EA’s new eSport initiative. Three new competitive events – Challenger, Premier, and EA Major, are poised to enhance competitive play among elite players. Challenger events let players host their own tournaments, Premiers will be larger gatherings hosted by both gaming and non-gaming partners, and EA Major are marquee events that pit the best players in the world against each other. A new Mass Effect: Andromeda trailer provided the most substantial look at the game yet, but details surrounding its plot remain elusive. BioWare did share that the game is built using the Frostbite 3 engine, and the team promises to build upon the elements players adored in the original trilogy. BioWare boasts Andromeda features the greatest amount of player freedom than in any game they’ve made. Frostbite 3 isn't the only big change coming to FIFA 17. EA's popular soccer title is getting a significant new mode in a story campaign chronicling life of rising soccer star Alex Hunter. Additionally, premier league managers are set to be featured and large-scale improvements have been made to player A.I. and physical play. EA continues its support of independent developers with the announcement of EA Originals. The initiative aims to support smaller titles by providing their development teams with the resources to bring their vision to life and thrive as a studio (such as allowing creators to earn 100% of their games’ profits). The first title to emerge from this is a whimsical title called Fe from Swedish developer Zoink. Set in a stylized forest, players control a cub with no memory of his past. By communicating with both creatures and plant life thorough song, players unlock new parts of the forest to explore. They must also combat the Silent Ones, malevolent entities corrupting the forest using silence. Fe forces players to carve their own path by omitting any kind of direction or "hand-holding". It's up to the player to create their personal experience. EA executive Jade Raymond highlighted the multiple Star Wars projects both released and in development. Among them are Visceral Games’ third-person action/adventure take bolstered by an original narrative, as well as Respawn’s own third-person game set in a different era of the franchise. While nothing was formally revealed, EA did share a video discussing the current and future of Star Wars games at EA. Battlefield 1’s action-packed gameplay trailer concluded the event. DICE confirmed that large battle vehicles such as airships and armored trains would be in the hands of players. Dynamic, unpredictable weather conditions such as rain and fog aims to dramatically alter the way players approach maps. The series’ signature destruction is more intuitive than ever before, with aerial battles looking especially impressive. EA kept thing short and sweet this year, focusing on concise, quick game announcements with none of the prolonged dull spots (e.g. Pelé last year) that plagued them years prior. Showcasing gameplay for anticipated heavy-hitters like Titanfall 2 and Battlefield 1 likely scored them a lot of brownie points with shooter enthusiasts. Mass Effect fans still don’t exactly know what Andromeda entails, but they got their best look at the title to date. EA Originals seems like another good option for independent games looking for a home, and Fe appears to be as weirdly intriguing as Unravel was before it. Not getting any formal reveals for Viscreal or Respawn’s Star Wars titles is a bummer as is the lack of any major surprises, but the games shown all look promising and gives EA a bright portfolio of titles on the horizon.